'Airbrushed' Clark Gable 1932-33 from La Fabrique Des Icones, the Paris exhibition of hand-retouched Hollywood photos 1910-1970. April 2105, the Galerie Argentic. Source: www.argentic-photo.com. Giving images visual impact, outside the camera, has a long history in photography and in the publication of photographs. An original photograph can often be improved by retouching, especially when the final form is a generation removed from the camera. When it is rephotographed. Or published. By 1990 and the release of Photoshop version 1.0, the tools of photographic retouching - airbrush, oil paint, opaque, and litho films - were crushed by computer rendering and digital manipulation. As Photoshop advanced and digital imaging became prevalent, analogue retouching and composite methods disappeared - giving way to form a new genre of photo manipulation. Often the "image" was no longer an "object" - it was simply a photographic projection onto a screen. Faded and forgotten became the words "that photo's been airbrushed". From 1990 onward was instead the exclamation, "that photo must be Photoshopped!" And eventually, most photographs were digitally manipulated for improved visual impact. Likewise most photos were no longer prints. Newspapers and Airbrush - Image Impact before Photoshop. As a photojournalist in the 1970's, my images were occasionally "airbrushed", just like today one might refer to an image as "Photoshoped". At the Fort Worth Star Telegram, the process camera operator had a desk inside the press room. He would perform untold horrors to my favorite images - blending out areas with 18% grey oil or gouache paint, and applying charcoal or India ink to outlines and contours for better reproduced contrast. Getting newsstand impact was challenging. Why? Because photographs were lifted onto bolts of course, pulp paper with inked impression from lithographic plates running on rotary press cylinders at 1500 feet of newsprint per minute. My photograph was just a step to the lithograhic film which was just a step to the plate which was just a step to the press, the paper, the news stand and your office, kitchen or barbershop. Wherever the newspaper found your hands and filled your mind. Retouching of photographed images began almost as early as publishing itself. Mass reproduction has a simple equation: attention grabbing images = sales. Visually, the image must get to the point, quick, or the publication loses its audience. And its sales. Before television and motion pictures, print media was the public's channel for news, advertising, politics and religion - the largest purveyor of cultural messages. In 1920 more Americans lived in cites than in rural areas. Newspapers thrived and 1 in 3 adults read a newspaper at least weekly. Photography was a large part of a publication's message. "Airbrushing" clarified the message. Dan Burkeholder - Turtle in Church, Alice, Texas, 1994 is an example of the early use of Photoshop after its release in 1990. Dan combined digital scanning of analogue images with Photoshop to create negatives - techniques familiar to mass publication. These massive digital negatives were then used to create platinum prints. The jump from airbrushed film stills to fine art photographs enabled by Photoshop may seem abrupt, yet it was becoming commonplace in the early 1990's to have flatbed scanners connected to personal computers through application programming interface or API. The "scanned''digital file was then available on magnetic media to be imported to Photoshop and from there printed by inkjet printer onto transparent films the size of the eventual fine art image, like Dan Burkeholder's Turtle in Church, Alice, Texas, 1994. Meshing analogue methods with digital files became an early signature of fine artist photographers using Photoshop in the late 1990's. Such methods began to define the digital pathways to fine art photography as it morphed from analogue processes with the advent of Photosop. Moving from the impact Photoshop would have on publishing, the cinematic staging of photographs also began to clarify the adoption of Photoshop upon artistic creation. Standing on the knife's edge of this transition is the work of Sandy Skogland. While the staging of photographs for narrative purposes can be found in the early work of F. Holland Day and Oscar Rejlander (Soure: ChuckDavisPhoto.com, Cinematic Staging (1980)), what separates Skogland's work is the elaborate staging immediately before and after the introduction of Photoshop in 1990. Skogland working on a cat model of her images. Sandy Skogland is a photographic artist known for elaborate staging of images without the use of Photoshop, although her work is contemporary to the 1990 introduction of the software application. Above shows the progression of her work pre- and post-Photoshop, using the same staging of cat models, painted green. 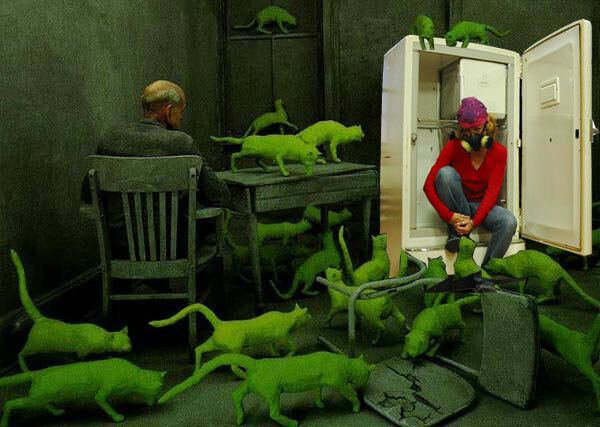 From Cats in Paris 1993 to the Radioactive Cats 1980 - Sandy is oblivious to the introduction of a software product which could have developed her vision - while others Photoshoped her images in obvious parody (Mo Rigley - Self Portrait with Fridge and Radioactive Cats). Even CGI images have been created in parody of Skogland (EnglishBob on Deviant Art). Finally, there is Skogland herself, photograhed while painting one of the cats she has used to span more than a decade of cinematically staged images. Despite the complex manipulation for which Photoshop is known as we approach 2020, decades ago early forms of digital manipulation were often more subtle, and the results likely more acceptable to an audience raised on vernacular photograhy. Bradley Rubenstein - Girl with Puppy Dog Eyes 1996 (inkjet print), a statement on the then-current debate on the potential for human cloning. From the exihibt: After Photoshop: Manipulated Photography in the Digital Age. The Met, September 25, 2013 to May 27, 2013. Linking the past to the present as a statement on the complexities of photography across 178 years since Nicéphore Niépce's view from an upstairs window is Joan Fontcuberta’s Googlegram: Niépce (2005). Unlike the low manipulation of Rubenstien's Girl with Puppy Dog Eyes, Fontcuberta captures the array of digital capabilities by inserting approximately ten thousand images acquired from a Google image search for the words "photo" and "foto", then applying those images as if in recreation of a Neo-Impressionistic painting by Georges Seurat (e.g., A Sunday on La Grande Jatte 1884). The pointillism is in fact pictures to the miniature scale of large, digital pixels - each an acquired photograph - cast over the image of the world's oldest photograph. Joan Fontcuberta’s Googlegram: Niépce (2005), 10,000 screen captures laid over a digital reproduction of the world's oldest photograph. This image also from the exhibit, After Photoshop: Manipulated Photography in the Digital Age. The desire to market messages in public media channels continues the need for retouching, just as it did more than eighty years ago with 'Airbrushed' Clark Gable. Anonymously, acquired image of an aging pop star from online publication ЦВЕТНО, Madonna before and after Photoshop, September 5th 2014. This idealized image of Madonna is far beyond the ability of a makeup artist. Yet because of the prevalence of Photoshop, our eyes find ordinary the loss of wrinkles, darken eyes, sharpened jaw and nose from a very recognizable subject of nearly three decades. The reality shifting software has become part of our visual language. Far beyond retouching is the overt commercial manipulation by 21st Century Photoshop artists like do_isole in this advertisement for Coke. The juxtaposition of the Harold Edgerton motives (for example from Milk Drop Coronet 1957) are curiously added to a cinematically created backdrop of cars seemingly rotated from a F5 Toronado - yet the subject stands calmly if in amazement of the beverage he is about to drink. Source: Digital Synopsis. Design, Advertising and Commercial Inspiration. 20+ Amazing Images Before and After Photoshop. When a software application has such a profound impact on media and hence culture - it becomes difficult to capture the impact on world population - projected at 7.5 Billion by 2020. Yet in fact it was impact which made Photoshop's creation in 1990 perhaps the biggest software success since the invention of Microsoft Word 1.0 in October 1983. Today global consumption of media is 506 minutes per day (Source: ZenithOptimedia) - more than half our waking state. Visual imagery is the predominant form of intake, and hence Photoshop's impact on media. Visual impact is needed in all forms of media and Photoshop (the noun) after the version 1 release in 1990 rapidly became associated with Photoshop (the verb), giving out-of-camera effect just like 'retouching" and "airbrushing" did before computers became publicly available outside of institutions. This blog seeks to position the early uses of Photoshop both before and immediately after its introduction. How it continued advancing the workflow of publishing, and then how it came to cross over to fine art photography. In the case of Dan Burkeholder, Photoshop was used very much like magazine or newsprint production - in the making of a transparency from an original image before reproduction and transfer to a paper object. An 1880's platinum printing process was adapted to digital technology 114 years later in the making of Turtle in Church, Alice, Texas 1994 - right on the cusp of the creation of Photoshop. Further to the period immediately after the applications introduction, yet without root in historical methods is the work of Bradley Rubinstein. Bradley scanned an image from a high school yearbook, and then used the lasso-cut-copy-paste & blend features of Photoshop version 1 to create visually what the public feared in genetic cloning of human beings. Their fear was that an accident of science might create the Frankenstein clone of a child with puppy dog eyes. Eyes which begged for attention to a subliminal nightmare in the context of 1996, when the Dolly the sheep became the first mammal to be genetically cloned. To say Photoshop has a profound effect on media and culture is the ultimate understatement. Photoshop is a verb. It is the visual language of our time. So much so only Computer Generated Imagery (CGI) and 3D or Virtual Reality (VR) can come to replace it. (1) In creating an analogue-to-digital-to-analogue image, it is estimated that more than 50 steps are needed to produce a controlled and replicable image, such as to be sold in galleries. I purchased Turtle in Church, Alice,Texas in the late 1990's from Ben Breard - owner of the Afterimage in Dallas Texas. Today this same image may be purchased from a much later printing - as much as 20 years later - yet the tonal depth remains very similar. (2) Dolly the sheep was the first mammal to be cloned at the Roslin Institute in Scotland, on July 5th, 1996. Amidst tremendous controversy, the public erupted over the morality of potentially creating a super human. Science was clearly ahead of social maturity.